And he saw them toiling in rowing; for the wind was contrary unto them: and about the fourth watch of the night he cometh unto them, walking upon the sea, and would have passed by them. But when they saw him walking upon the sea, they supposed it had been a spirit, and cried out: For they all saw him, and were troubled. And immediately he talked with them, and saith unto them, Be of good cheer: it is I; be not afraid. And he went up unto them into the ship; and the wind ceased: and they were sore amazed in themselves beyond measure, and wondered. For they considered not the miracle of the loaves: for their heart was hardened. Jesus had fed 5000+ people with 2 loaves of bread and a few fishes, followed by calming the raging sea and scaring the pants off His buddies and they were sore amazed and wondered. They’d already forgotten about that amazing lunch He provided from basically nothing! It was as if the bread and fish were a little miracle by comparison to the angry storm. How much different is it today? We are so impressed when God does what we deem amazing, when the amazing is being done right before us every day in our lives by the provision and sustainment of life. So why are worrying about the waves of this election? I’ve seen some really positive, good posts on social media recently about what Jesus can do through this election, but I feel they’re being over looked by those wanting to sensationalize, and refocus us on the stormy waters surrounding the candidates. I will confess that the candidates of choice are not my choice, but I have to look at what I have available. The folks on the ground that day with Jesus had but one choice for dinner, “bread and fish.” The miracle was not in the choice, it was what God did with the choice. I feel the same way about this election. I don’t think either one of these people are living at the foot of the cross, but I know the One Who died on the cross for the salvation of man, and He can work a miracle with the matter. It’s not much… I wouldn’t call those two a happy meal, but… let me preface this by saying I’m voting for Trump. Not because he’s all that and bag of chips, but I feel he is the provision for America and Hillary is the destruction. I won’t get into anything other than that. That alone is enough for me to ponder today when the world would rather I worry. If Christians will pray and vote… in that order, rely on God to take care of us as well as work for Him until He comes, this might be the most amazing four years of American history! We’re coming down to the final days of the primary election, and although I’ve pretty much made my mind up on who I’m voting for, I’m not happy with any of the choices. I don’t like having to vote in a leader of our nation by choosing who is the least evil. But here we are! The world would have us believe our nation is without hope, but as long as I serve Jesus Christ, being without hope is not an option. Because He is hope defined! And so to find His hope we must go to His book and follow history, which does seem doomed to repeat itself, but we can also use the historical facts to revise the plan that our idiot leaders have put in place. Not very godly calling our leaders idiots? Probably not, but I stand by it. Hey, they’re pretty good at it already! But look at the child Josiah in 2 Chronicles 34 who began to reign as king at the ripe old age of eight! He had way more sense than our current administration. Josiah was eight years old when he began to reign, and he reigned in Jerusalem one and thirty years. And he did that which was right in the sight of the Lord, and walked in the ways of David his father, and declined neither to the right hand, nor to the left. He didn’t go to the right or the left. Wow, could we learn a lesson there? And that’s not a plug for any other political party, that’s for throwing the political party notions out completely. America could begin an incline if we just walked straight. If honesty was the rule, not the exception. If we turned our nation back to God and acknowledged that because of Him, and only Him, we are still here. Not to the right or to the left… just straight. Even as a child Josiah knew that. Perhaps because he was yet to be jaded by the politics of the day. Another childish attribute that may be worthy of re-visiting. I don’t mean in the literal sense, although that would work, but what about breaking up collective groups of people who go against the foundation that America was established upon. You know… the foundation that made us a great nation. In verses 3-4 Josiah, now at the age of 16, he began to seek after God and through God’s guidance he broke up those who worshipped other gods and destroyed their nation through idolatry and filth. “But it’s a free country,” they say, “We’ve got rights” they say. I’m okay with that. But I too have rights; and my rights tell me that you don’t have the right to corrupt my children and grandchildren, take away my ability to defend myself and speak the gospel where ever it is that I want to. And if you try to take that from me, it’s my right to break stuff. Like breaking up your organization who only wants freedom for self, not for others. 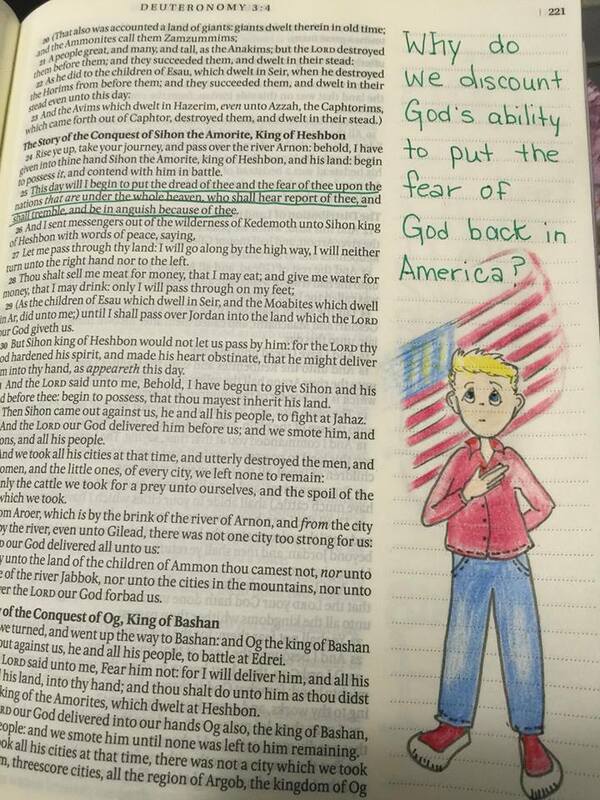 A nation returned to God because a teen decided to break stuff. Whew! That’ll preach. For in the eighth year of his reign, while he was yet young, he began to seek after the God of David his father: and in the twelfth year he began to purge Judah and Jerusalem from the high places, and the groves, and the carved images, and the molten images. And they brake down the altars of Baalim in his presence; and the images, that were on high above them, he cut down; and the groves, and the carved images, and the molten images, he brake in pieces, and made dust of them, and strowed it upon the graves of them that had sacrificed unto them. And he burnt the bones of the priests upon their altars, and cleansed Judah and Jerusalem. And so did he in the cities of Manasseh, and Ephraim, and Simeon, even unto Naphtali, with their mattocks round about. And when he had broken down the altars and the groves, and had beaten the graven images into powder, and cut down all the idols throughout all the land of Israel, he returned to Jerusalem. At the age of twenty six, when he had finished breaking stuff, Josiah began to build, and he began with building the spiritual side of his nation. America could do wonders for the economics of our nation if they’d start building back the churches. Josiah’s leaders put finances under accountability and put the worshippers back into place. They weren’t worried about who had the finest chariot in the community they were concerned with making the house of God back into its prominent position. Josiah knew that God had to be central in getting his nation back, so they began to rebuild the church. Oh my stars can I get an Amen. We have the buildings… but we need the accountability and worship, and we need to be building God’s church by filling His pews with people. Are you building? Are you inviting people to church? Now in the eighteenth year of his reign, when he had purged the land, and the house, he sent Shaphan the son of Azaliah, and Maaseiah the governor of the city, and Joah the son of Joahaz the recorder, to repair the house of the Lord his God. And when they came to Hilkiah the high priest, they delivered the money that was brought into the house of God, which the Levites that kept the doors had gathered of the hand of Manasseh and Ephraim, and of all the remnant of Israel, and of all Judah and Benjamin; and they returned to Jerusalem. And they put it in the hand of the workmen that had the oversight of the house of the Lord, and they gave it to the workmen that wrought in the house of the Lord, to repair and amend the house: Even to the artificers and builders gave they it, to buy hewn stone, and timber for couplings, and to floor the houses which the kings of Judah had destroyed. And the men did the work faithfully: and the overseers of them were Jahath and Obadiah, the Levites, of the sons of Merari; and Zechariah and Meshullam, of the sons of the Kohathites, to set it forward; and other of the Levites, all that could skill of instruments of musick. Also they were over the bearers of burdens, and were overseers of all that wrought the work in any manner of service: and of the Levites there were scribes, and officers, and porters. And when they brought out the money that was brought into the house of the Lord, Hilkiah the priest found a book of the law of the Lord given by Moses. Remember what it was like as a child, or when your children were small and how they loved to be read to? When Hilkiah “found the book,” the very Word of God that had been forgotten Josiah insisted that they be read to. And the entire nation heard the word of God! I almost cut this blog down by picking out parts and piece of this scripture to fit my points. But then I thought, that’s what’s wrong with America. We’ve stopped reading and listening to the Word of God and that’s who we got ourselves in this mess. So this is the entire chapter of 34, and it’s still just a very small portion of what God needs us to hear. Finish the chapter, and then determine in your heart to make a difference and hold on to Hope! Don’t forget that church day is in just a few days… get busy building! And Hilkiah answered and said to Shaphan the scribe, I have found the book of the law in the house of the Lord. And Hilkiah delivered the book to Shaphan. And Shaphan carried the book to the king, and brought the king word back again, saying, All that was committed to thy servants, they do it. And they have gathered together the money that was found in the house of the Lord, and have delivered it into the hand of the overseers, and to the hand of the workmen. Then Shaphan the scribe told the king, saying, Hilkiah the priest hath given me a book. And Shaphan read it before the king. And it came to pass, when the king had heard the words of the law, that he rent his clothes. And the king commanded Hilkiah, and Ahikam the son of Shaphan, and Abdon the son of Micah, and Shaphan the scribe, and Asaiah a servant of the king’s, saying, Go, enquire of the Lord for me, and for them that are left in Israel and in Judah, concerning the words of the book that is found: for great is the wrath of the Lord that is poured out upon us, because our fathers have not kept the word of the Lord, to do after all that is written in this book. And Hilkiah, and they that the king had appointed, went to Huldah the prophetess, the wife of Shallum the son of Tikvath, the son of Hasrah, keeper of the wardrobe; (now she dwelt in Jerusalem in the college:) and they spake to her to that effect. And she answered them, Thus saith the Lord God of Israel, Tell ye the man that sent you to me, Thus saith the Lord, Behold, I will bring evil upon this place, and upon the inhabitants thereof, even all the curses that are written in the book which they have read before the king of Judah: Because they have forsaken me, and have burned incense unto other gods, that they might provoke me to anger with all the works of their hands; therefore my wrath shall be poured out upon this place, and shall not be quenched. And as for the king of Judah, who sent you to enquire of the Lord, so shall ye say unto him, Thus saith the Lord God of Israel concerning the words which thou hast heard; Because thine heart was tender, and thou didst humble thyself before God, when thou heardest his words against this place, and against the inhabitants thereof, and humbledst thyself before me, and didst rend thy clothes, and weep before me; I have even heard thee also, saith the Lord. Behold, I will gather thee to thy fathers, and thou shalt be gathered to thy grave in peace, neither shall thine eyes see all the evil that I will bring upon this place, and upon the inhabitants of the same. So they brought the king word again. Then the king sent and gathered together all the elders of Judah and Jerusalem. And the king went up into the house of the Lord, and all the men of Judah, and the inhabitants of Jerusalem, and the priests, and the Levites, and all the people, great and small: and he read in their ears all the words of the book of the covenant that was found in the house of the Lord. And the king stood in his place, and made a covenant before the Lord, to walk after the Lord, and to keep his commandments, and his testimonies, and his statutes, with all his heart, and with all his soul, to perform the words of the covenant which are written in this book. And he caused all that were present in Jerusalem and Benjamin to stand to it. And the inhabitants of Jerusalem did according to the covenant of God, the God of their fathers. -And Josiah took away all the abominations out of all the countries that pertained to the children of Israel, and made all that were present in Israel to serve, even to serve the Lord their God. And all his days they departed not from following the Lord, the God of their fathers. I woke up fed up, but made up my mind not to give up. American politics didn’t change who I am but it did change how I view people. God created me with a heart of compassion, even pre-salvation my tender heart always wanted to right the wrongs of other people. I have no prejudice in me because of the color of a person’s skin, or a lifestyle of sin. Sin is committed by all of us, and it’s not justified by any of us; but forgiven by the Lord Jesus Christ upon the acceptance of Him as Savior and the price He alone paid on Calvary. I can’t work for it nor will my compassionate heart gain me any brownie points with God. Compassion is expected. So why did I wake up fed up this morning? Because the Lord feeds His people the finest cuts of meat and they spit it out on the ground in exchange for ice cream. And I, brethren, could not speak unto you as unto spiritual, but as unto carnal, even as unto babes in Christ. I have fed you with milk, and not with meat: for hitherto ye were not able to bear it, neither yet now are ye able. For ye are yet carnal: for whereas there is among you envying, and strife, and divisions, are ye not carnal, and walk as men? Preachers preach their hearts out expounding the truth in the Word of God, but because it goes against what the “world” deems as acceptable, even the parishioners who are in the house of God on Sunday don’t want to hear it and rally against it as if they have the authority of Almighty God to change what is right and what is wrong. I’m fed up with that non-sense! But I still believe that there’s a few of us left who believe the Bible from cover to cover, who don’t read between the lines or change the lines, we just accept it as truth. And because there are a few of us left I believe God has been merciful to America and would love to show this egotistical lot of Americans who it is that’s in charge and Almighty. But the few of us who are left must be bold. Because the world views the life of an animal more valuable than the life of a human. And forthwith Jesus gave them leave. And the unclean spirits went out, and entered into the swine: and the herd ran violently down a steep place into the sea, (they were about two thousand;) and were choked in the sea. And they that fed the swine fled, and told it in the city, and in the country. And they went out to see what it was that was done. And they come to Jesus, and see him that was possessed with the devil, and had the legion, sitting, and clothed, and in his right mind: and they were afraid. This is slightly out of context of Mark 5, because I don’t know that the pig keepers cared more about their pigs than they did about the crazy man in the cemetery. But I can say flat footed today that the people of America (as a whole) would care more about the pigs than the crazy man. Don’t get me wrong… I love critters, and believe that they should be pampered and loved on. But if it came down to the life of my dog or the life of my child, it’s not up for debate. My child wins, or anybody else’s child in harm’s way. But Americans will scream bloody murder for the rights of a dog that maimed a person but will say nothing when a child is murdered before it’s allowed to be born and it’s body parts sold by Planned Parenthood. How much longer will God be merciful to us who say nothing? 3. I’m fed up with those who mock Christianity and attempt to belittle the Lord Jesus Christ. God said, “I saw you feed and care for my people.” Even though the world tries to belittle what Christian’s do and to stop the ministry of feeding hungry souls the Word of God, we just need to continue on, fed up or not. Just keep feeding people the truth, because God sees, and one day those who mock will mock no more. Love the unlovable. The crazy man at the tomb may have been a politician. What do you do when the world around you is full of wickedness and you’d like to lash out and do ungodly acts? When you’ve had it up to your eyeballs with bad attitudes and hatred spewed in the name of politics, when the Name of Christ is uttered in contempt and it seems as though it’s in vain that we attempt peace? There was a day that it took a woman to fix the mess that man had created. He was about to find out! The next thing you hear David saying is “Gird ye on every man his sword”. It was the equivalency of the Power Rangers of the day. But then came Abigail. A few lessons from Abigail that help me this morning in the face of this adverse world we live in. Living with a man such as Nabal was not an easy task, and though it would have been the culture of the day for her stay it wouldn’t have made it fun. Yet we find her there with an obvious respect of her household and a desire to care for them. Our main role in this life (aside from the first serving God) is to take care of our family and make it as pleasant as possible. Abigail had garnered respect and honor, her husband’s staff obviously felt that she was competent to get something done because when they’d heard what Nabal did to David and knew that there would be certain repercussions, they came to Abigail for help. It’s often not easy serving when the world around you disregards God and His people. But it’s important to stand strong in the faith so that in the hour of need, those around us know in whom they can depend. As soon as the servants came to Abigail with the news of her idiot husband’s behavior she went into survival mode. She knew that she would need to fix what her husband had broken. She didn’t go to David with excuses, she went to David with humility. We’re not going to gain God’s mercy and grace on this Nation by making excuses, we’re going to have to go to Him in humility for our idiot leadership who spout off to God with their behavior “Who is God?” I have wonder how many times the sword could have been drawn on us if it had not been for God’s people taking that opportunity to intercede on America’s behalf. Abigail waited… both in time and in service. We should do no less.